Can You Create Your Own Tinnitus? Discussion in 'Support' started by Steve A, Jan 19, 2015. I just joined, and I'm asking a question I can't seem to find anywhere. Most of the time, I forget it, but then every now and then I'll notice it again. I am worried that I'm imagining the whole thing, but it's now been 5 days, and not just a random night. I've lost 3 separate nights sleep over it, and the more I think about it the worse it gets. Basically, I'm starting to sound a lot like people with Tinnitus! I think I've heard the noise before when I haven't been able to sleep, often due to high blood pressure or playing sport too late or something. Is it possible that I have imagined my way into having this!??!?! The sound is there alright. When I block my ears or put ear plugs in, it's all I can hear... but I never had a prolonged period like this before that phone call. I'll be gutted, cause I'm only 31 yrs old and I have a long time to put up with this if it's permanent! Has anyone else ever encountered this, where thinking about Tinnitus has caused them to hear a ring they hadn't previously noticed? I think that if you listen long and hard enough, you can here normal body sounds. This is also what TRT explains to you, that tinnitus is or can be a normal body sound. "In ' 97 my wife and I signed up for a course in meditation (TM). During class we had to be as quiet as possible and try to completely dismiss our thoughts. To help clear thoughts out of our minds we had to continuously repeat some stupid meaningless mantra-like word. After each session we had to describe what we experienced to each other. One of the things we noticed was that all of us could hear the various noises originating from town. The types of noises which are always present, like a train, the traffic, the police and ambulance sirens etc. - the sounds you normally do not notice consciously. Your hearing threshold becomes noticeable lower. During the third class, in addition to all the town's noises, I started to hear a high pitched whistle. I wondered, despite the fact we were told not to think, where the hell does this whistling sound come from? Nobody else seemed to hear it. After classes I could still hear that darn whistle. I could still hear it even after we'd left the building, even in the damn car on the drive home. From that moment on, I knew I was in trouble. That night it was almost impossible to get to sleep and I started hearing humming noises to boot. Many, many virtually sleepless nights followed." So I think that you can really bring a normal body sound upfront and this can make you trouble. Or this guy here had T already before, but was not aware of it. Don't stress about your sounds. They could be normal body sounds. The less you care and listen for it, the sooner they go into background again. Of course, easier said than done. That's how I got it. Not from hearing about tinnitus and imagining it, but from doing a lucid dream technique where you focus on the different senses (hearing included) for minutes at a time. Two things I think I should note. First, in my case I had to do the technique multiple times, and for many minutes, before the tinnitus sound got loud enough to stay. I actually remember noticing it get louder and more persistent after each cycle's hearing step. I thought it was cool, that I was influencing my senses just by thinking about them, and didn't realize there could be a health/mental-peace issue at stake. Secondly, and more importantly, you may be able to take some comfort in having become aware of tinnitus now (if in fact that's what it is). Most likely, you already had some level of tinnitus-related brain or ear activity, that was just brought to fruition through your thoughts on the topic. And, especially if it was through hearing damage (e.g. Loud music, ear infection), it may well have come about later anyway. By knowing about it earlier, (while overall it's probably negative), at least you can use that early knowledge to prevent further damage to your ears that could otherwise have intensified the sounds. All in all, know that while the sounds may or may not fade away at some point, the initial anxiety you're feeling will steadily go down either way. While it's true I'm still mad at tinnitus/am not pleased by it, I no longer feel much anxiety about it unless I'm tired or something. Most of the time I just acknowledge it, and get back to what I was working on. Thanks so much for your replies folks. Intuitively, I suspected what you have both said... these sounds were not unfamiliar since I'd heard them before. But previously I just thought "whatever" and carried on and they seemed to go away, whereas now I'm actively listening to see if I can hear it (subconsciously as well as consciously). Whether this is a "body noise" or some pre-existing mild T doesn't really matter I suppose. It's only bothering since I started paying it some attention and putting a name on it. Thanks for the tips, and appreciate the swift responses too. All the best, I'll be sure to update if this gets better/worse. For more information just Google 'Heller and Bergman Quiet Room Experiment'. An experiment conducted in 1953 that confirmed most indivduals without previously being aware of their tinnitus, suddenly experience it for the first time in a soundproofed room. This is very interesting. If the brain is able to consciously detect tinnitus, maybe it can eventually reverse and learn to 'not detect' it. Let's hope every one of us can achieve this. Best wishes everyone. Yeah Katkin, that's what I'm hoping. Last night was the worst I've had it, sadly, so the noise is getting louder. I'm going to get down to the Tinnitus clinic soon as possible to see if I can get a grip on this sooner rather than later. I'll report back on their opinions of whether this kind of experience is common. One things for sure - I can now completely sympathise with my Dad! You never know (in many cases) the cause of the onset of T.
I was looking to a documentary about a woman with severe tinnitus on April 15th, 2014. I was shocked and fascinated, and started to look for tinnitus on Google. Then, two and a half weeks later, May 3th... I was just sitting on the couch on a saturday afternoon,... my ear/head started making noise. Like EEEEEEEEEEEE and SSSSSSSSSSSSSSSSSS. I don't know the cause. I also had bad syringing in March, it did not go well. The doc was pushing water with high pressure in my ear for half an hour! So my inner-ear could be damaged. But it is a big coincidence I think, that I now have tinnitus after looking that documentary about it and read all about it on the internet. Anyway... good luck to you. Hope yours will dissapear. Exactly Gabrielle - mine was virtually instant... literally just a couple of hours of researching online about my Dads condition and I had it. It hasn't gone away since and that was 5 days ago. I don't notice it much during the day, but at night it's like someone turns on the amplifier. 1 - I had the same basic experience. In 1999 I developed visual problems, and google led me to the conclusion that it might be "HPPD", from some adolescent drug use or SSRI use. I came across the phrase "people with HPPD often have tinnitus", panicked, started listening, and lo and behold EEEEEEEEEEEEEEEEEE. 2 - Negative association and fixation on basically harmless stimuli can make them horrible. 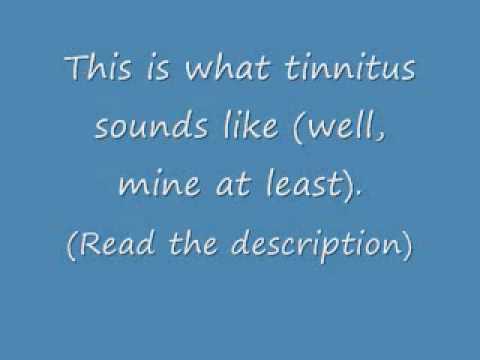 In ~2008, at a time when my tinnitus hadn't been much of a problem for years, I developed a "lump in the throat" sensation which drove me bonkers for a couple years, and I think the distress it caused was basically "tinnitus like", in that I was fixated on a particular stimulus to the point where it blotted out the sun and swallowed up all my other senses. There's actually an entire (esoteric) school of yoga dedicated to developing tinnitus, basically. I've met a lot of people who say, "I don't hear it unless I think about it." My Dad rang me on Aug 18th to tell me he had come down with Tinnitus. I went online and googled some stuff trying to help him of course. A week later I developed Tinnitus - Came on over night and followed me around for a few days and then became permanent. Tinnitus is highly contagious. Everyone can hear these sounds if they listen and then when they label it it becomes permanent. We have had exactly the same experience. At least we know we dont have any structural damage. In theory we should be able to push this back to where it came from for 90% of the day. Its horrible to know we did this to ourselves - But we were just trying to help the old man out of concern - Nice reward eh! Alas, thinking about something as in visualising or listening for something can create changes in the brains neural architecture. It's like holding a picture in your minds eye, when you do so the unconscious mind finds it difficult to separate what's real from what's not. That's why visualising is so important to competitive athletes, they're training their brain to operate at maximum or optimum efficiency for the real thing. Even minds eye (or minds ear) constructs in the brain have to link up to other areas to catagorise the sound for what it is. Is it relevant to memories? Is it linked to any, values, visual connections? Once all this malarky takes place you have new "nodes" in your brain which connect to other nodes and you have a trigger for that particular sound. Once the "minds ear" stops thinking of the sound; Guess what, the nodes go looking for it elsewhere like an internet connection jumping from server to server across the world till it finds it's destination. Sometimes they find it very faintly ringing away where you never noticed it before, then you think about it...and the connections get stronger, then you worry about it, and they get stronger still. Guess what happens when you stop thinking about it and worrying about it? Yeah @RCP1 that was what I struggled with - a bit like what @I who love music said - you feel so unlucky and hacked off at the world. I must say, I feel significantly better now than a month ago. I still hear it at night, but I find that if I say "I don't care about you... do your best to keep me awake you <insert expletive>" I fall asleep not long after. It's definitely an emotional thing over anything else, so as long as I can conquer that emotional response I can near enough manage the T.
do you find any treatment for your tinnitus Steve A? my story is exactly yours! I have an appointment for a cat scan (which is really a ruling out process) which I have only just got round to organising. I will have that next week. I also have a hearing test which I need to organise for next week also. Both of these appointments were authorised/prescribed by the GP. After that, we'll have a better understanding of the diagnosis of my T.
In all honesty, I'm not hopeful of ever "curing" it, but I've grown used to it and I must admit that most of the time I hardly notice it. And when I do notice it, I've been able to distract myself quite quickly. I've spoken to a lot of people who've suffered or do suffer, and some of them say that they naturally just tuned out of it after a year or two (kind of like I have over the last 6 months). This is optimistic of course, but it fills me with hope that learning to live with it and ignore it is a gradual and continuous process of improvement. In short, I've still got T, but I feel much better about it now than I did 6 months ago. I'll update more once I get the results mentioned above. Thank u so much Steve! please inform us if you find any useful treatment!!! Must be horrible to study medicin. All those diseases they read about. I'm still with tinnitus, do u find any treatment? Hi Ibcman1 - sorry, I have gotten married since my post, and am actually on my honeymoon as I type, on New Years Eve! hahaha what a romantic!? I had the hearing tests, and passed fairly clearly. I had the CAT scans, and passed emphatically. But I also must say, it's all been about "making friends" with my T, and essentially forgiving it for being such a prick. This has enabled me to laugh to myself about it... I personally like to visualise a Hippo or a Buffalo, who can do nothing about the birds which land on their backs, and peck away at them... but they don't seem to mind! You can argue that they serve a purpose in cleansing their host, but somehow the animal has to find a way to block out the complete irritation of the bird. We can do it! It's NYE, so I must encourage you to think "this time next year, I'm going to be much better at nailing this than I am right now... so bring on 2016!" Congrats!! On your marriage and progress with T.
Thank you so much Steve and very congrats!! I think this event make us stronger and more thankful! This is an encouraging read. I had mild tinnitus when I was a kid and as a teenager but I seemed to forget about it for years until 2010 when it suddenly got louder. I only noticed it was louder when I was moved from a noisy work environment into a quiet office by myself. It was whilst I was in the quiet office I noticed it and thought "My T has got louder," Then I started talking about it to others and listening for it more. Within one week it was all I could hear or think about and I was signed off work, a complete insonmiac, anxious and depressed. I still struggle so much and it has worsened over time. Steve's story gives me hope. Even though it's so loud these days and my brain is well tuned into the noises, perhaps there is still away of improving things and tuning out. I'm in the same boat as you! Any improvement? Would love to know.